HANOI, Vietnam -- The US-North Korea summit in Hanoi on Thursday ended with the two sides failing to reach an agreement. 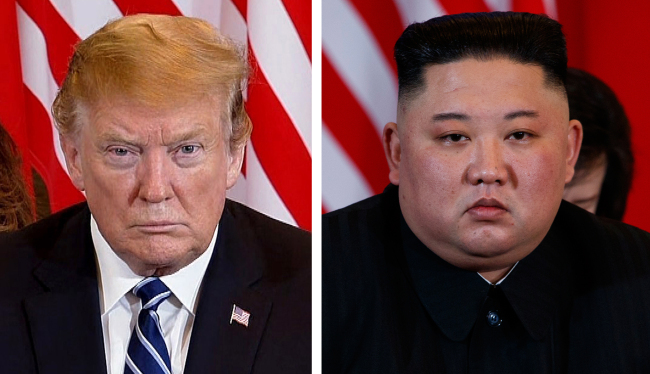 US President Donald Trump and North Korean leader Kim Jong-un had met at the Sofitel Legend Metropole Hotel in Hanoi and held three round of talks, but no results were forthcoming. According to the White House, Trump and Kim engaged in a second private meeting in the afternoon in place of a scheduled working lunch. Trump and Kim met at about 9 a.m. and began the day with a private meeting followed by an expanded summit. The events were initially scheduled to be followed by a working lunch, then a joint agreement signing ceremony. Trump was set to hold a press conference at about 4 p.m., but the event was moved forward by two hours. Kim and Trump left the summit venue at about 1:25 p.m., and headed to their respective hotels. “(Kim and Trump) had very good and constructive meetings in Hanoi, Vietnam, on Feb. 27-28, 2019. The two leaders discussed various ways to advance denuclearization and economic driven concepts,” White House spokeswoman Sarah Huckabee Sanders said in a statement. Before the summit events began Wednesday, US news outlets citing unnamed Trump administration sources had reported that the two sides had reached an agreement. The agreement was reported to have included declaring the official end of the 1950-53 Korean War, and the US agreeing to a partial lifting of sanctions in return for the North halting operations of nuclear facilities. Going into the morning’s meetings, the two leaders had appeared positive. “If I were not ready for such things, I would not have come here,” Kim was quoted as saying by White House pool reporters in response to a question on whether he was ready to denuclearize at the start of the expanded meeting. Asked if he was ready to take concrete steps, Kim said that he was discussing related issues with Trump. The US president took the opportunity to stress his relationship with Kim, saying that it is “as good as it’s ever been,” and added that the two sides will reach a deal that is beneficial to both the US and North Korea. The comments echoed earlier statements of confidence from Trump and Kim. They arrived at the hotel ahead of the scheduled 9 a.m. one-on-one meeting, and briefly spoke in front of cameras to start the day of talks. “Much effort has been made, and now is the time to show (results). A great conversation is being continued for the second day here in Hanoi,” Kim said, adding that the world’s attention had turned to the meeting. Kim later commented that while he did not wish to predict the outcome of the meeting, his instincts told him that good results were in store. The US president once again touted his relationship with Kim. “The relationship is very strong. And when you have a good relationship a lot of good things happen,” Trump said.